As part of my studying for SharePoint development exams 70-573 and 70-576 I have been looking at areas I haven’t had any previous experience and trying them out. As part of this I decided to look at creating a customer SharePoint Designer action. The scenario I decided to look into was creating an action which accepted some parameters and then created a new site at a specific location. I won’t go into the code for this as its fairly straightforward. What I wanted to highlight was the problems I encountered when trying to add the action to a test SharePoint Designer workflow. When starting out I have a look on the web and found a few articles to get me going, see links below. I followed the first article but found when I deployed this the new action appeared in SharePoint Designer but when I clicked on this nothing happened the action didn’t appear in the workflow. Looking at the comments on the site it appeared a few other people had the same problem but there was no answer out supplied. I checked and re-checked my .actions file, the manual web.config entry and setting in in the advanced section of the package in Visual Studio. 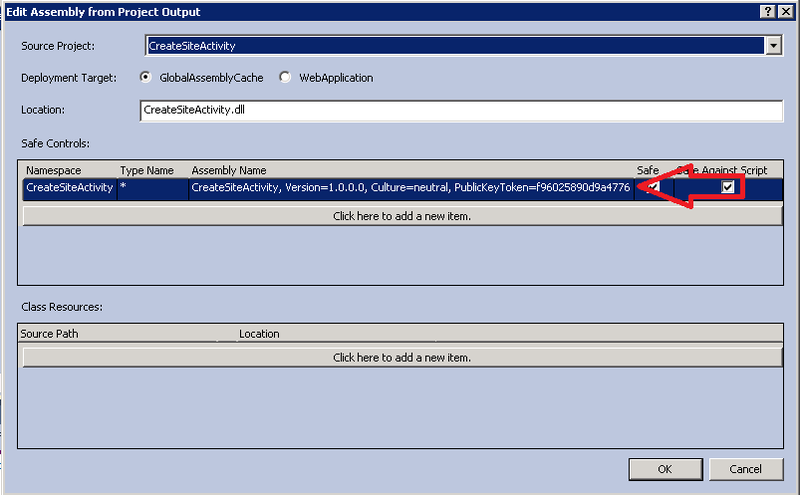 All the components like the assembly name, version number and public token key all looked the same. Eventually out of frustration I copied the whole string in Assembly Name attribute set in the package, see figure 1, and copied and paste it into the two other locations and it worked. At first I couldn’t believe this would make a difference as long as the assembly name, version number and token were correct but it seems like the string has to match exactly, see below figures 1 2 and 3 in which the only difference is figure 2 doesn’t have a space between the assembly name and the version and this doesn’t work. You are currently browsing the archives for the Sharepoint Designer 2010 category.